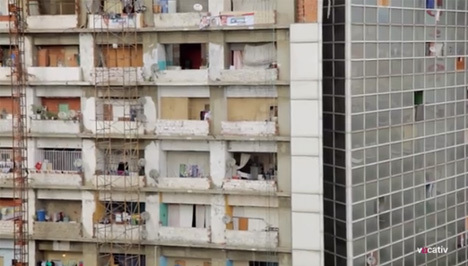 Housing over 2,500 squatters on 28 of its 45 floors, the Tower of David is a half-finished structure in Caracas, Venezuela, populated with displaced people. Like the now-vanished Kowloon Walled City or a huge vertical tent city, it is feared by officials and runs by its own rules. Its residents pool resources, including skills and money, to create and maintain independent and communal water supplies, plumbing and power grids. Even the police are afraid to enter this effectively lawless structure, but through friends one video journalist was given permission to tour and film the facility – you can follow his adventure via the video above. What may be most remarkable is how much like a normal building it is, with new couples coming in and renovating dwellings, and established businesses (including a hair salon) and community spaces (at least one church). That is, of course, ‘normal’ once you get past architectural surprises like the absence of windows along some faces and the dizzying drops of dozens of stories off of unmarked edges lacking railings. 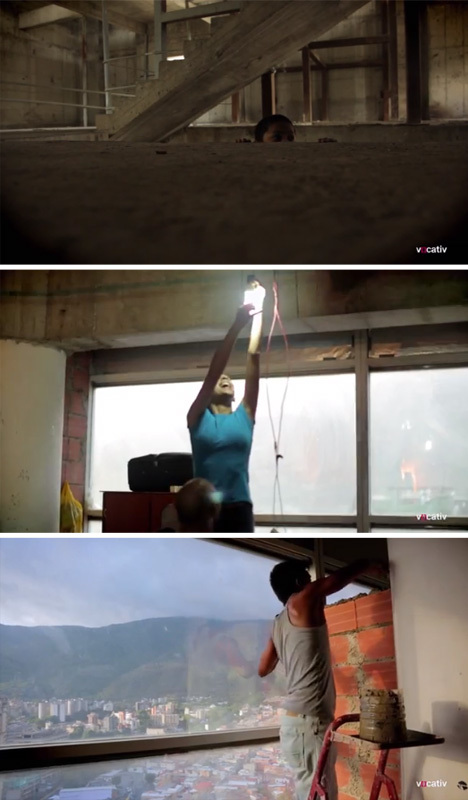 The authorities also claim the structure is a hotbed for crime and violence, home to gang activity and drug cartels, but this one brief documentary, at least, suggests things are a bit more complicated than that. 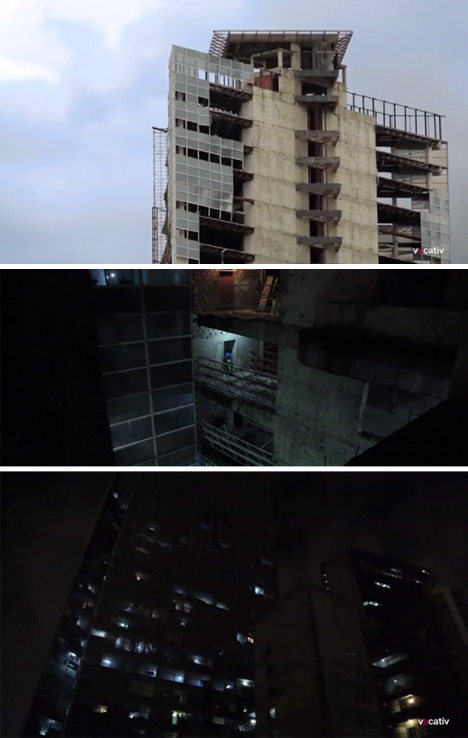 As we described in previous coverage and with other images, the structure was being built into business skyscraper when construction halted during the 1990s financial crisis. It was then effectively abandoned and has since become a haven for a squatters who started moving in during the subsequent crisis 2007/2008. Now, these residents ride up the first ten stories taken by moped taxis or, if sufficiently poor, walk the distance. 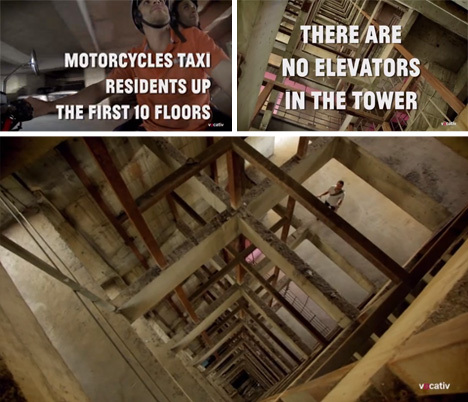 With no elevators, some skyscraper dwellers have to walk dozens of stories to get home. As in pre-elevator days, the top floors are thus the least desirable and many remain unoccupied – from outside, you can see the light dwindling up toward the upper stories at night.